Dunleavy Limited Edition Giclées are available for purchase online. Shop Now. Giclée (pronounced "zhee-clay"), is an invented name for the process of making fine art prints from a digital source using ink-jet printing. The word "giclée" is derived from the French language word "le gicleur" meaning "nozzle," or more specifically "gicler" meaning "to squirt, spurt, or spray." The first step to creating excellent quality giclées for Dunleavy art is to professionally scan the original. Our manufactures' are the first and only fine art reproduction houses to offer the largest flatbed scanner of its kind. The design is the most accurate image capture device for the art industry. Its active scan window is 44" wide by 72" long. The scanner was engineered to capture all the subtleties of fine art, from brushstroke texture to deep shadow detail. 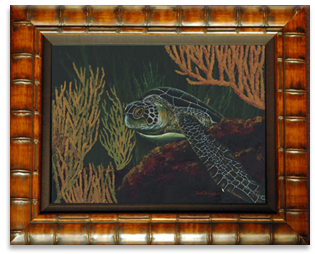 With a Direct Scan, Dunleavy Art reproduction is the first generation away from the original. It is difficult to choose the original from the Giclée at first glance. Being the largest flatbed scanner of its kind, they can scan oversize originals in one pass safely and with little handling of the original piece. The scanner's lamps are scientifically created to capture the original just as your eye would see it. No digital cameras are used in this process. An Iris/Giclée print is the highest quality print available in today market place. When the process is done correctly it consists of a one-to-one high-quality scan of the original, High Resolution Printers, and an ICC (International Color Consortium) color matching software package. There is no visible dot screen pattern; the resulting image has all of the subtle tonalities of the original art. The technology provides incredible detail and brilliant color. The resolution (DPI or dots per inch) is actually higher than traditional lithography (1800 DPI for Giclée as opposed to 1200DPI for lithographs) which shows crisp contrast with rich, intense color. When canvas prints are treated with a waterproof UV coating, Dunleavy can even hand embellish the image to produce another original piece (or Dunleavy Edition). Producing high-end Giclée prints is much more than color management and quality prints. The color professionals at our manufactures are committed to perfected color proofing, matching the original exactly. They are color experts and trained using Adobe Photoshop. They work closely with Dunleavy to guarantee that high color needs are met. Printers include the Scitex IRIS 3047 and the Mutoh Falcon 60" wide by unlimited length with Ultra Chrome archival inks. The Iris printers produce an apparent resolution of 1800 dots per inch while spraying over 1 million droplets per second onto the selected substrate. The preciseness of the printing along with the depth of color range captures the subtleties of an original. The Iris printers utilize dye-based inks with an incredible color gaumet. The longevity of the prints is 75 years. The prints must be protected, kept out of direct sunlight and treated gently. The Mutoh printer is a pigmented printer which gives a life expectance of one hundred years and protects the prints from water. However, the color gaumet is not as wide as dye-based inks.